Physique big arms workout. Young fit man working out with heavy equipment, back view. Men muscular back. Back view of athletic man in black sportswear throwing weight ball in wall working out in gym. Man working out in a park. Slow motion. Back view. Fit sportsman jogging on a forest alley. Camera tilt down shot. Man running fast on a park road. Real time shot. Back view. Freedom and energy. Camera follows sportsman working out. man is having street workout. back view of a male working out. 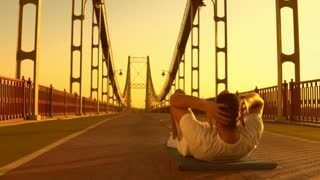 man is jogging along the bridge. caucasian guy working out outdoors.